Cassandra J. Francis, CRE, has over twenty-five years of diverse real estate, construction and urban planning experience concentrated at the nexus of the public and private sectors. Currently, Cassandra leads an international real estate, construction and planning advisory services practice and conducts civil commercial mediations specializing in real estate and construction disputes worldwide. Having worked in the commercial real estate, construction, transportation, housing, infrastructure, banking, Olympic Games and non-profit industries, Cassandra applies her broad experience to enhance projects, programs and processes. Cassandra is both a pro-development contributor to the built environment and an advocate for high-quality open space within the public realm. Cassandra is a Counselor of Real Estate (CRE), a Fellow of the Royal Institution of Chartered Surveyors (FRICS), a Member of the Chartered Institute of Arbitrators (MCIArb), is certified by the American Institute of Certified Planners (AICP) and is a LEED Accredited Professional for Building Design and Construction (LEED AP BD+C). Interest in, and use of, the Public Trust Doctrine has reached unprecedented levels recently in response to the growing threat that urban growth poses for parks and open spaces. The Public Trust Doctrine forces governments holding land assets in trust on behalf of the public to balance their short-term interests against the long-term protection of irreplaceable parks and open-space resources. Lawsuits aimed at protecting the public trust have increasingly been used by advocates to force local and state governments to carefully consider the competing interests at work in cases of proposed alienation or change of use of parkland and the impact on future generations. The Public Trust Doctrine, with roots extending back to Roman law and the Magna Carta, maintains that some natural resources that are fundamental to public welfare and human subsistence are held in trust in perpetuity by the state as common resources for the benefit of current and future generations. In its role as trustee, the state has the duty and fiduciary obligation to prudently steward these natural assets in support of the public’s interest and may not alienate or transfer assets for private purpose nor materially impair their value, accessibility or functionality. The Public Trust Doctrine speaks to both the right of the public to access, enjoy and benefit from these natural resources, as well as the obligation of the state to protect, manage and preserve the public’s vested interest in these assets. Cities across the world are experiencing a dangerous convergence of opposing forces: tremendous development pressure on the one front and the importance of public, open spaces on the other. Urban areas are experiencing a renaissance as populations flock to cities and the energy, economic activity and social amenities they provide. United Nations data indicates that almost 70 percent of the world’s growing population will move to cities by 2050, potentially adding another 2.5 billion people to urban populations around the world. This population growth will create huge demand to expand the built environment to accommodate this thriving mass. After decades of experiencing out-migration of urban residents and businesses, cities are now poised to attract their share of this growth and excited at the prospect of increasing resources and economic vitality. Alongside this rapid growth in the built environment is an accompanying disappearance of the inverse of built space, i.e., open space, whether it be undeveloped privately-owned land or public land, some of which may be dedicated as parks or natural open spaces. Indeed, in urban centers we are currently seeing the erosion of open space, both public and private, at a rapid pace. If not carefully implemented, one does not have to look far into the future to see the potentially adverse result of this additional development and its impact on our relatively scarce open spaces. Many areas of our cities are already plagued by overwhelming density, traffic and overcrowding. Building codes, zoning and land use controls are employed to manage and balance elements of the built environment to accommodate growth while avoiding the negative aspects associated with urbanization. Thoughtfully planned design, placement, density and scale of buildings are critical to the optimal functioning, aesthetic and enjoyment of our cities. The same is vitally true of the open spaces between buildings, although these open spaces are frequently an afterthought. Parks and open spaces are often not universally and preemptively valued for the respite and breathing space they provide, as a sanctuary to escape the city, but also a place from which to appreciate the urban jungle at its periphery. That our parks and open spaces are increasingly experiencing development pressure, particularly in key locations, is not surprising. It is crucial we protect our existing parks and expand our parks systems to meet the growing demands of growing populations. Now is a time when cities are competing on a global basis for tourists, residents, Millennials, corporate headquarters, students and tax revenues, just to name a few. This global compulsion towards growth and the importance of the attraction and retention of these assets, has created a plethora of worldwide rankings including The Economist’s Global Liveability Ranking, Mercer’s Quality of Living Ranking, the Metropolis’ Worlds Most Liveable Cities, Sustainable Cities Index, and Monocle’s Quality of Life Survey. While cities vie to be the smartest, most liveable, most walkable, most bike- and dog-friendly, most connected and safest cities, parks are obvious assets in achieving high rankings. Cities around the world are going to great lengths to reclaim their littered and fractious waterfronts for public use and large urban parks are becoming some of the most important tourist destinations highlighting bespoke public art and guided Segway tours. While few may think we are approaching a negative tipping point in the contraction of our parks and public open space, data indicates an emergent and accelerating crisis if we do not proceed in a very disciplined manner. The Trust for Public Land’s (TPL) ParkScore® and City Park Facts studies measure land owned by regional, state and federal agencies and evaluates these public assets relative to acreage, investment, amenities and access. 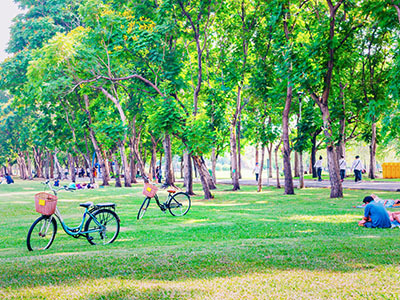 For many urban areas, TPL’s measures chart a decline in parks and public space that underscore the need for cities to aspire towards increasing the percentage of the population living within a ten-minute (half-mile) walk of a public park and to increase the total acres of public open space per 1,000 residents, a measure which is significantly linked to quality of life and livability indices in global city rankings. By way of example, the City of Chicago prides itself on being at the forefront of urban park development, with an extensive historic park system connected by broad boulevards, the home of the famous Millennium Park “Bean,” the revamped Northerly Island Nature Park and the newly-opened 606 Park Trail and Chicago Riverwalk. However, in TPL’s 2016 data, Chicago ranks fourteenth of eighteen of the U.S.’s high-density cities having only 4.6 acres of parkland per 1,000 residents compared to a median of 6.8 (behind such older urban cities as New York at 4.7, Philadelphia at 6.9 and Boston at 7.6). The National Recreation and Parks Association recommends 6-10 acres of urban parkland for every 1,000 residents as a goal. While there are different factors that impact a city’s ability to achieve this goal, when it is forecasted that urban populations will grow significantly in the next few decades, these numbers must be watched closely. Beyond the competitive quantitative park measures by which cities are evaluated, there are qualitative factors as well, including those related to the functionality of parks, including their specific uses, their relative size, their location and their condition. Parks were historically defined as either active or passive, meaning perhaps having a natural, bucolic or formal garden setting versus having sports fields, beaches, pools or a community center. Now, in our increasingly thrill-seeking society, many parks are more likely characterized by their entertainment or commercial features, their festivals and events, including new interest in hosting zip lines, surf pools, climbing walls, Ferris wheels, music festivals, athletic events, restaurants, theaters, museums, other attractions and mega events in the pursuit of excitement, novel destinations and, of course, rental revenues. Many of these elements reduce urban open space and its utility and create a frenetic character far from what had been enjoyed in the past. Loss of parkland due to private, cultural and institutional development (in the form of public schools, libraries and other facilities) and the increasing commercialization and privatization of park management and assets are putting further pressures on our public open spaces. This becomes increasingly true as easily available, low-cost, well-located land becomes more scarce in meeting the appetite of governments, institutions and the private sector for development sites. Cultural institutions and commercial entertainment destinations are wonderful endowments for a city and should be promoted, but not at the expense of public parks. While all these uses may create revenue or drive traffic to parks, and it is clear that revenues are needed to maintain park assets, there is already tremendous competition for the use of public open space, demonstrated by the well-publicized clashes between different park-using populations from dog walkers, organized sports teams, naturalists, festival goers and skateboarders, to name a few. And further, it is a false prophecy to pronounce that it will be only “this one museum,” or just “one more” library as the appetite for these uses will continue to grow alongside population and humanity’s desire to innovate towards new experiences. Any confiscation of public parkland is a very dangerous precedent as we slide down the proverbial “slippery slope”: once open space is built upon or land (or its use) is alienated from public ownership, it will be virtually impossible to return to its former undeveloped, public state. So how do we prevent the erosion and confiscation of public parks and their recreational or natural open space value which contributes to making great cities great? How do we convince leadership in growing cities that public parks are not lower-cost, shovel-ready development sites for the newest eye-candy institution, novel restaurant, or to be used at the whim of the connected, powerful and wealthy? One tool that has been used in the past with varying success is the Public Trust Doctrine, a modern take on an ancient legal premise which holds that the government has a duty to current and future generations whereby it may not alienate key public assets that it holds in trust for the people. The Public Trust Doctrine imbues the government with a fiduciary responsibility to manage and grow the value of specific public assets on behalf of trust beneficiaries, both current and future. The government, as trustee, is not allowed to transfer or otherwise reduce the public utility of such assets without the explicit approval of broader government (in many cases state legislatures) and only in cases where there is a demonstrated and substantial public benefit. This protection was originally focused on such resources as land along navigable waterways in order to allow the public to access water resources for fishing and recreational use, to which every citizen was deemed entitled. However, the Public Trust Doctrine has been extended in some cases in the U.S. and other countries to include a duty of the government to protect such public resources as inland parks, historic buildings, drinking water, natural energy resources and even the Earth’s atmosphere. What is essential now is that we further perfect the Public Trust Doctrine as a tool to be used to protect public parks. There have been numerous attempts to use the Public Trust Doctrine to prevent the transfer of these public parkland assets to other uses that eliminate access or reduce their utility as open space. These efforts have resulted in varying degrees of success for a number of reasons. Park preservation efforts are often led by “friends of the parks” groups whose interest in parks is at the hyper local level. As these groups transform from local park boosters to organized crusaders in response to specific threats, these operations tend to be one-off operations, typically led by those not well-versed in the Public Trust Doctrine, who are volunteers with no ready funding sources to support protracted legal battles. Additionally, local governments have increasingly utilized specific defenses to the Doctrine which have met some success when cases have been filed, often arguing bureaucratic technicalities (“explicit” vs. “implied” park dedication or arguing a park was never properly titled or intended as a park long term) and fairly dubious alternative public benefits (for instance, the collection of stadium sales taxes or a museum being open free to the public a few days per year) to support public parkland re-appropriation. Other loopholes pursued by government include the question of “standing,” where the government might claim lack of sufficient injury to the public or suing entity (in the case of the granting of a long-term ground lease with reversionary rights) or that actions are simply “exchanges” of public parkland (by providing lesser parkland elsewhere that is often of less utility, value and access). These tactics become very divisive and play into local politics, which can lead to targeted campaigns and influence peddling. Also, when appealing cultural institutions, attractions or celebrity-led initiatives attempt to control or use parkland, through time-sensitive and competitive national or global siting exercises, the false calculus is often employed that a city will only gain the new facility by giving up valuable public parkland. Recent notable examples include the proposal to locate the Lucas Museum of Narrative Arts, dubbed the “Star Wars Museum,” on Chicago’s historic public lakefront. Despite the fact that the City of Chicago has had an ordinance in place since the early 1970s explicitly stating that there would be no further private development on the lakefront, the city attempted to dismiss a lawsuit opposing the use of the lakefront site, questioning the issue of “standing” and arguing the 99-year ground lease did not constitute an abdication or transfer of control of the site. In an interim decision, the federal district court found that the suing organization and members of the public, “who are beneficiaries of [the public] trust, must have the right and standing to enforce it” and that the Chicago Park District did in fact intend to alienate the parkland through the transfer of, “the exclusive right to use and control the museum site to a private entity.”1 While the case did not reach its conclusion and the establishment of solid case law, the fact that the judge ruled against the City of Chicago’s motion to dismiss and allowed the trial to proceed was not only a significant victory for the Public Trust Doctrine, but caused George Lucas to look elsewhere to site his museum. The true tragedy of this process is that there were many nearby attractive city-owned alternative sites for the museum in Chicago, but the entrenched leadership remained focused on the protected lakefront site, losing a wonderful opportunity for the city. Encourage our local government and civic leadership to avoid the temptation to see parks as development sites and to exercise discipline in growing the city without impacting public open spaces.